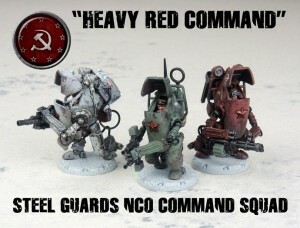 Battlefront shows off the upcoming Steel Guards NCO Command Squad for Dust Tactics over on the GF9 website. Nicknamed “turtles” by their comrades, these patriotic warriors are anything but slow. The Steel Guards NCO Command Squad can strike targets with its powerful anti-infantry ordnance at impressive range, and it boasts the same special skills as Allied and Axis NCO Command Squads.